For over 30 years rush-overland has been manufacturing heating and pumping equipment for the oil & gas and wastewater industries. Zeus is the newest edition to rush’s vacuum truck line. Like all of our trucks, it is purpose built to meet your specific application. Ease of operation, maintenance and customer input is designed into every unit. Let rush design your next hydroexcavator to meet your specification and needs! Handle solids, heavy sludge, slurries as well as the toughest liquids. The Zeus Truck will pick up anything that can fit in an 8” hose! Ultimate protection of blower using dual Cyclones to filter the air prior to the final filter. 2600 USG Debris tank with internal baffle, full opening rear door and 8”x 26 ft reach x 6 way hydraulic boom that operates 320 degrees with standard wired pendant and optional Wireless system to remotely control the system. Various water pumps and hose reel configuration based on our needs. Water system is designed for your application in your area. Standard warm weather features with optional cold weather system to protect system in sub-zero environments. The one truck that handles all of your heavy duty hydroexacavating needs! 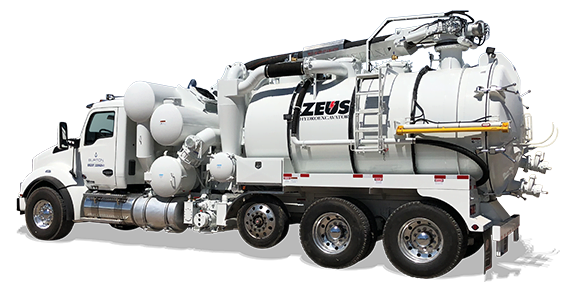 The ZEUS SERIES is combination of decades of vacuum truck design and manufacturing experience with the superior quality that you have grown to know and expect from RUSH OVERLAND MANUFACTURING. Hydraulic dump cylinder for dumping tank with Semi-Automatic tank safety stand. Primary shut-off mounted in 20” Manway. Easy access for removal and servicing through lid of manway. 6” Manual suction valve mounted on rear head with 6” Standpipe, deflector plate with aluminum camlock and cap. 15 psi pressure relief valve. 6-way hydraulically operated 8” Boom extendable to 26 ft c/w with heavy duty boom hose and band lock fittings and 320 degree rotation. Three 8” x 60” diameter boom extension tubes mounted on the side of truck. Roots DVJ 827 PDB capable of 5775 CFM and 27” full vacuum driven by heavy duty OMSI driveline mounted transfer case. Optional Robuschi/Gardner Denver RBD-145 or Hibon 8702 blowers available. Dual 20” Cyclone for filtration of airflow to minimize carry over with 20” drop box and 3” drain valves. 30” diameter final filter assembly with 100 micron washable inline filter to protect blower. 12” Check valve to protect blower from turning backwards. Dual 8” Disconnect piping to allow tank to dump. 400,000 or 700,000 BTU/hr heater for cold weather operations. Vacuum loaded water tank using hydraulically driven vacuum pump. 2700 E. Interstate 20 Service Rd.